The package (ISBN 978-0-415-73036-5) contains the second edition of Theory for Today’s Musician (ISBN: 978-0-415-66332-8) and the Theory for Today’s Musician Workbook (ISBN: 978-0-415-66333-5). The package is available for print books only. 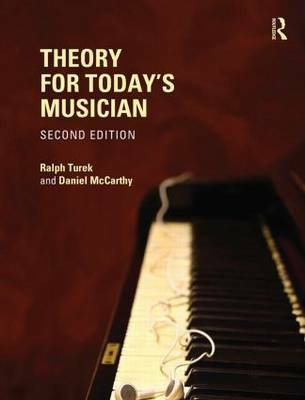 Theory for Today’s Musician, Second Edition, recasts the scope of the traditional music theory course to meet the demands of the professional music world, in a style that speaks directly and engagingly to today’s music student. It uses classical, folk, popular, and jazz repertoires with clear explanations that link music theory to musical applications. The authors help prepare students by not only exploring how music theory works in art music, but how it functions within modern music, and why this knowledge will help them become better composers, music teachers, performers, and recording engineers. This broadly comprehensive text merges traditional topics such as part-writing and harmony (diatonic, chromatic, neo-tonal and atonal), with less traditional topics such as counterpoint and musical process, and includes the non-traditional topics of popular music songwriting, jazz harmony and the blues. Written by an experienced textbook author and new co-author, both active classroom teachers for many years, Theory for Today’s Musician is the complete and ideal theory text to enable today’s student to accomplish their musical goals tomorrow.